It’s time to have our traditional end-of-study giveaway! This time we’re giving away $123 worth of Doorposts products! Hundreds of Bible verses organized according to 52 common types of misbehavior, along with numerous parenting ideas and suggestions, patterned after Scripture. 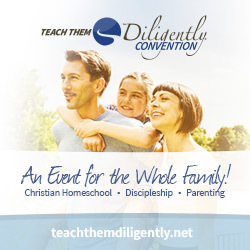 our brand new chart for parents, Ingredients of Godly Discipline! Answer one of the following questions in the comment section of this blog. Answer both questions in separate comments for two separate entries. Anyone can enter, even if you didn’t do the study. If you haven’t completed the study yet, you can still answer the questions, based on what you have finished. The giveaway will end at midnight, Monday, August 10, 2015. What suggestions do you have for improving this study? What would make it more useful or easier to use? Something The Lord has taught me recently is that He is sovereign. I control nothing in this world. Being overwhelmed with anxiety and worry is a familiar feeling when you try to control everything in your life..and your children’s…and your husbands. I grew up being the oldest child of three so it’s natural for me to take matters into my own hands and think I have to “fix things.” I have what I call “the moma gene.” It’s like I was a moma before I was even a moma because I was always trying to take care of my siblings. Trusting God is something that is a daily routine for me. Some days I still fail to relinquish control but he is still merciful. The more I trust him the easier it gets because he proves himself faithful everytime. His promises are true and HE IS MIGHTY! Through this study God is reminding me that I need to check my own behavior as a parent before I expect more from my kids. Or maybe AS I expect more from them. My behavior often needs just as much adjusting as theirs does. I know it’s an obvious answer but every time I read my Bible, pray and/or complete devotions I always hear His still my voice reminding me, “Be still and know that I am God.” I don’t have this world figured out but the best encouragement is I don’t have to, because God reigns victorious over this world and has prepared a place for everyone who come to Him through His Son Jesus Christ. One important thing I have learned recently in my Bible study is that the Bible has help for all areas of my life. Also God is ready to help me all I have to do is ask. I don’t really have any suggestions of things to improve the Bible study I thought that it was great just the way it was. This was my first time attempting one of these Bible studies. I kept up pretty well for the first two weeks but then we went on vacation and had company and I fell off and stop doing studies. I would still like to finish them.so the only suggestion I might have is to go a little bit slower but at the same time I really wouldn’t want to suggest that. Instead I think I just need to do better at keeping up. what a wonderful study! I haven’t finished it yet, but am slowly making my way through. I think the most important thing I’ve learned is that discipline of my children begins with my own discipline. no specific suggestions – It was a lot of material, but I think the blog format allows you to go at your own pace. I would not take anything out, as it is all great information and learning, but I was rarely able to finish a whole day every day. it will probably take me 2 months to do the whole study, but I want to be able to really study it all. thank you for all of the wonderful insights, resources, and teaching of the word. blue letter bible is new to me and so great to know about and learn how to fully use! Trust is always a work in progress. I have learned I need to listen more. Too often I interrupt my kids when they are explaining or asking a question so I can address something I think is more important regarding their behavior, but I could really be more patient and address the whole issue and have less strife in my house. Something I’ve recently heard in my bible study and am stilling mulling over is that there is a difference in peace-making (as in the beatitudes) and peace-keeping. How often do I want my kids to just keep the peace so I don’t have to be bothered vs. making peace in their relationship(s). It struck me through this study just how biblical discipline and rearing children is- not just things my husband and I have come up with. It’s been an excellent reminder that I need to discipline faithfully – not for myself but because it is what God commands. As for improving the study, I think this one was very well done. I did not feel like there were “assignments” I could not complete in one day. Maybe the only suggestion would be for those days when a key word search is used you could mention which version you are searching and how many results it yields so we know better if we put the words in right in the search box. I absolutely live studying my Bible now thanks to the things I have learned through your studies. I never fall asleep while doing my devotions now no matter the book of the Bible I am reading. The activities of study keep me enfaged. He’s showing me that when there is an area in my life that needs more of Him, all I have to do is slow down and worship. We can worship in the car while we are driving, in bed as we are lying there, or even in the shower. There is no reason that we can’t have enough time for our relationship with Him. I learned that there are hands on ways to teach my children roots for good behavior. They really liked the pouring of dirty water, playing in the mud and examples with swords. I am learning and being reminded everyday as I read the Bible at how important my example is. My children learn more on what I do than what I say. If I’m not real or consistent they know it..they too will follow in my footsteps. I did not like using Blue Letter Bible. I understand you were probably being asked to promote their website, but a bible study site should have many translations of the bible available and not blatantly oppose certain Christians (Catholics). If this is also the belief of the Doorposts Company, then I cannot support you anymore. I used Bible Gateway for as much of the study as possible once I read Blue Letter Bible’s stance on certain versions of the Bible. It took me a little bit to get the Blue Letter Bible down but the study itself is great..thank you! I learned that I should not hold my kids to a standard that I am not holding myself to. And they are watching me and I need to be showing growth in my life and victories in Jesus! Thanks for that! Two major realizations…1. Howuch I need to understand God’s grace and extend that to my dear family, and 2. This is a study I could do for a while year and still not master it. Each day I need to work on my own heart in regards to discipline and it then spills over to my kids. I am much more peaceful about the process with the information in this study. Thank you! I do not have any suggestions, I think the Bible Study is wonderful. Thank you! One thing I have been continuing to learn in my studies is the comfort that God controls ALL things, in all circumstances! I am not finished with the Bible study yet, but one thing I realized is that I need to be a lot more consistent in my actions and in how I discipline my own children. The study was more than I could.do each day and I did not use the blue letter bible. I have very little kids and not much time to sit at the computer and focus. However, the info in the study is still priceless and the Facebook group REALLY helps!!! Something God has been teaching me is that training children and learning to walk as a Christian- even in my own life- is a process. Life is a journey. Heaven is the end point. Perfection isn’t possible here. I should try my best but realize more and more how absolutely dependent I am on Him for His grace, strength, mercy, wisdom, help…for everything. I can’t and won’t always get it right and neither will my children, but we can rest and trust in Him. These studies are great! I do find it challenging to keep up, so maybe 2 catch-up days would be nice. But, it is great that we can continue at our own pace. 1. I recently read the Proverb about a cheerful face bringing joy to the heart. I recognized that I don’t often relax my face and smile when I am trying to work hard at goals or when talking to the children, and so I tried it. Even when I needed to reprimand my son I was able to speak to him with a smile that helped his confidence. He was soon smiling and obeying. 2. I loved the study and although I’m behind, I want to finish up and that’s why I’m on here this morning. Thanks for introducing me to the tool of the Blue Letter Bible! As for improving the study, I’m not sure of any ways it can be improved upon. This was my first study with you. I was overwhelmed some days by how long it took me to do the day’s lesson, but my sister just died June 21 and I have been dealing with a lot of extra feelings right now. The biggest thing I’ve taken away from this study so far (I haven’t finished yet) is to impress God’s Word upon my heart, soul, mind, emotions, etc so that I will be better equipped to teach my kids. I can’t expect behavior from my children that I’m not modeling for them. I really can’t think of a way to improve the study. I loved it! It was my first Doorposts study, and I can’t wait to go back to some previous ones to do! God has taught me through this study that I need to expect more from my son. It is laziness to not expect more Godly behavior from him. Due to my laziness- he continues to discobey me and therefore God. I have not yet completed the study, but my only suggestion would be to give some real life examples. I like to see relevant real life situations, it helps me learn. Thank you for this study!!! My suggestion is to include the link to the blue letter bible every day within the assignment making it an easy click away when studying. Even after being in the parenting mode for 29 years, I’m still learning that God’s Word is my strength and life-blood. I too easily fall away from time in the Word and time with Him in prayer. I end up standing on my own and fall EVERY time. Scripture is essential to every aspect of our Christian walk. One of my favorite things I learned in this study was the importance of consistency. 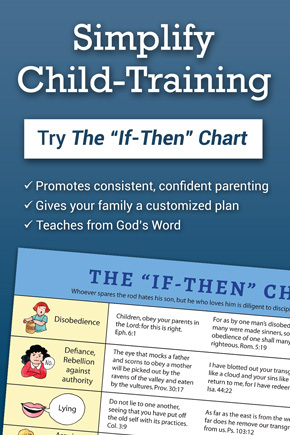 With our new if-then chart, it has been very easy to direct the children to their offense and administer the appropriate consequence. I am so excited to use more of the doorpost tools in my parenting! I really have no ideas for improving any of your studies. They are excellent and give me a great sense of direction and ideas to ponder. I just need to be more disciplined in staying the course. I have learned that my frustrations and overwhelming problems are not directly caused by my children’s wrong doings, but my sin that has provoked them. what an eye opener. To be reminded that even Christ learned through suffering and disipline is so amazing! The relationship between a perfect GOD Father and a perfect GOD son is such an example to me. It reminds me to take action even when I want to let sin slide. I’ve learned that God is more concerned about the heart than anything else. Our behavior is just a reflection of what is going on in our heart. It’s important to make sure as parents our hearts are where they need to be and be striving to tune and direct our children’s hearts towards the things of God. Gods been teaching me that I need to come before Him everyday…without Him, I am acting in pride. “God gives grace to the humble.” I need His grace, every hour of every day. May He continue to use your ministry for His glory and the good of many who love Him! The only thing I would add is to make it to parents because this study would be applicable to all parents, not just Mamas. I haven’t been able to complete the study, but what I have completed has been great. My only suggestion of improving the study would be to do more days on a particular subject. It has been a really great study and I look forward to another one soon! 1.One thing I have gotten recently from a Sunday School study on prayer is that James 4:2 would be so much more impactful in all of our lives as Christians if we would simply take time to talk to God and ask Him for the things that we have need of. He already knows what we need and wants to pour out His blessings upon us, but so many of us are falling short in our prayer lives. We either doubt His true ability or feel our needs are not great enough to warrant His interceding. One of the many things that stuck out to me was that there are areas of disobedience in my own life that i need to address so i can better help my boys to obey and to understand why we obey. I found that I do not have the self control to start my morning on my phone/computer. I found it helpful to print out a hard copy page, so I would not become distracted. It was a copy/paste method, but maybe a printable version would be helpful? Grateful for this ministry! the biggest thing that God showed me in this study was my speech. i dont really yell but to often my tone is sharp an snappy and im to impatient to wait an hear my children out. i really appreciated you explaining how to use the Blue Letter Bible through out the study. I think it would be helpful to include the link to the tool right in the study just for ease of using the study and the tool together. On the days that there were a lot of verses to look up or study i wished for another day so i could go a little more slowly. You have it set up though that you can take longer and I am still finishing the study. We recently studied the passage of the widow giving two coins as a family. Studying it again with my children and seeing how they struggled to understand how such a small gift could honor the Father really challenged my heart. I often feel like as a Mom of three little ones I have so little left to give in ministry to others. But Father reminded me that I must give what I have and trust Him to multiply my gift. I’m way behind on the study, but have enjoyed it so far! Thanks for all the work you do putting the studies together! One thing I have learned is that I really have to make sure I’m disciplining myself before trying to discipline my children. Great reminders for making sure that I set a godly example and don’t get frustrated and overwhelmed by things – this doesn’t help the children to obey – makes them frustrated and exasperated! Thanks again! Through a ladies group I attend, we have been studying Romans. God is reaffirming that Christ accomplishes salvation for us COMPLETELY. We receive Him by faith and are joined to Christ and receive the blessings of sonship and co-heirs with Jesus. The Lord has been teaching me through this study how my willingness to submit to my authorities affects my children’s willingness to obey me. The only thing I think could improve the study is to make it more even. It may just be me, but one day it takes me 45 minutes and the next only 10 minutes. It is a wonderful study and I’ve learned so much. Thank you! It’s been challenging for me to follow this study. I am hoping that it will be compiled into a devotional. I have recently learned that I am often harsh when I need to be gentle and kind. I’ve really been convicted about modeling the very behaviors and words that I don’t want my children to do. The bigest thing it has taught me, is that God’s only comand for children is to obey and how incredibly important it is for me to train my child to do just that in a loving but firm way. I don’t really have a suggestion for making the study better. I like how many of the days are quick and easy. Occasionally there’s an assignment that I get stuck on for a while, and often that’s because I want t go deeper than the material asks me to. I think 1 way to improve it would be to make a page with each day linked on that 1 page so that we can revisit this study easily later on and others may find it easier to study the first time if they are not going through it at this time. Through studying Gods Word, I have learned more than I can include in this email. However, He is faithful (and that doesn’t depend on if I am faithful enough), He is Mightier than any situation that life brings ( Fear not, for I am with you; Be not dismayed, for I am your God. I will strengthen you, I will uphold you with My righteous right hand). That I am always loved, even when I feel the pressures of trying to be everything to everyone, and do everything for everyone. He reminds me He has a plan. I don’t need to try and figure everything out. I need that quiet time with Him in prayer and study to be renewed, and strengthened. Gods Word is a lamp to my feet and a light to my path. answer 1: That I will be held accountable for what I teach my children. I have also been brought back to the Biblical way of bringing up my kids and that I need to not have an attitude of “do as you are told but by what you see” in my kids life. So I personally have to work on being an example to them. I have drifted from the Lords Way of teaching and resolving conflict in my household especial between my son and my daughter. There have been a lot of moaning and fault seeking between them and that led to tattle tales. answer 2: I am receiving the blog via my email and I don’t also have access to the internet to fall back on bible verses as per the blog via the Blue Letter Bible. I would love to receive those reference verses with the email. Something I continually learn in these studies is how amazing God is! As I learn to look deeper into His word I learn more and more the intricate design He has for not only the world but my life! Thank you for teaching how to study God’s word. The Lord keeps on teaching me how very much I am dependent every day on Him. So many times I “think” I have it all together or have the right answers only to find the exact opposite is true. So very thankful to this study (and the others) for keeping me grounded in the Word. I have been learning that our children are not our own. It is our job to train and Gods job to change their hearts. The one thing I would have mentioned that needed improvement was then improved right in this Child training study–the one day blog post that has ALL the days linked directly. Now I can use that one post to easily find where I am (since I am not done with it yet!). Thank you. Answer 1: A very important lesson Jesus has put on my heart is that I need to be putting the word into my children’s hearts, just like I do with myself. I benefit from it, and they will too. Thank you so much for this study – I really learned a lot and will be reviewing my notes for a while to soak it all in! One thing that really struck me was early on in the study how the mouth speaks from what is in the heart and comparing that to the commandment that we should have the Word of God in our hearts, it makes perfect sense that the most important thing we can do for our kids is to get them to hide God’s Word in their hearts. God has said that His Word would not return void; it will never be a hindrance to our children for them to have God’s Word in their hearts – it can only do them much good in their lives. What is one important lesson God has taught you recently as you study the Bible? Although I have come to find comfort in daily Bible reading for several years, I really learned how to better use on-line Bible reference tools to dig in and study God’s word for myself through this Bible study, and I am grateful for the skills that I will be able to apply to other Bible studies. One important thing I’ve learned or been reminded again…is that it all starts with me! My relationship with the Lord, my example to my children, my knowledge of God’s Word, etc…I can’t expect them to be obedient etc, when I’m not where I should be…thanks so much for the studies! One of the best things I’ve gleaned from this study, is how to pinpoint the heart attitude behind the sinful behavior in both my children and myself as well as the tools to be able to address the heart attitude. In this study, I have been very convicted about the idea that I am not only to avoid evil, but I am to abhor it! And I am not only to seek to do good but I am to love & cling to good! (Romans 12:9) Therefore when I am dealing with my own sinfulness, I should not only seek to repent and change but I am to hate the sinfulness and flee from it. The same thing with my children, if I truly abhor the sinfulness that bubbles up from them, then I will not get lazy and let something slide but I will actively correct, teach, & discipline as necessary because I love them and want that “evil” to be far from their heart. Instead of getting angry in a situation, I should “abhor” that the anger leads me to yelling at my children and bring myself to the foot of the cross seeking the healing of my heart issue. So much great stuff to think through, pray about, & let God do His work in me and our family! What suggestions do you have for improving this study? What would make it more useful or easier to use? It would be helpful to have a list of reference books for offline study that would serve the same functions as the online Blue Letter Bible website. I would love to grow my Bible study library and would like suggestions for good references. I can’t think of anything I would improve with the study. I thought the daily lessons were more manageable than some of the past studies, and that helped. I love using Blue Letter Bible – it has so many helpful resources that I’ve used many times since learning about it from these studies. Thank you so much for putting these together for us mamas that have a hard time finding time to study as we should! It is such a blessing! As far as improving the study? I don’t know… I have really enjoyed it and this is my first time doing one. I am behind in it, But it has been a real blessing to me! Answer 2: This is a great study. It has taken me sometime to get use to the lay out of it. It takes me on average an hour to complete it. I enjoy it, but it makes it difficult for me to be able to complete a full day in my limited time. If I’m being honest, it requires me to convince myself to do it everyday because its a lot more involved than just opening the bible and studying and journaling about a few verses and what the holy spirit is speaking to you. Which is what I’m used to. Another thing that isn’t optimal is that I have to be on my phone or computer in order to study the bible. I want to be able to open the actual book and get into the word. When my children see me sitting in my chair squinting and scrolling on my phone they think I’m just playing on my phone. Also, studying on my phone is very tempting to do other things (ex: check my email, check facebook, look up recipes etc.) I like to have my phone out of sight so it won’t tempt me to get distracted. I DO like the “children” section where I can teach my children and be purposeful about what the word teaches them. I like that we put it into action and practice. It really hits it home for them. Thanks for the study! Recently, the Lord spoke to me through His word when I was really struggling with my attitude toward an extended family member and even my own children. One verse in particular hit me right between the eyes. I now have this posted on my kitchen cabinets to help keep my attitude in check throughout the day. If I am His, I must act like Him! I haven’t done the obedience boot camp, so I can’t answer your second question, but I plan to start it soon! Thank you for the opportunity to enter into this great giveaway!! There is nothing I can think of to improve this study because it already works so well for me. I love having the daily emails because then I save them in a folder and go through them at my own pace. This way I never feel behind. The only thing I can think of to suggest is to find another way to make the facebook page easier to navigate the comments from each day. The hashtags don’t help me when I want to find threads from a particular day. If there was some way to make each day of study like a separate “event” with all comments about that day falling on that page that would be great. However, I don’t know how to suggest efficiently doing that without extra work & time put into it since I am not very familiar with how the pages are set up. I am constantly learning that I don’t really know Him well enough. To be like him, to make right choices as a parent, wife, friend, servant of Christ, I must KNOW who He is. I MUST be in the Word more and more. I am in a season when that is really hard. It is not always easy for me to sit at my computer to do the study. I wish that there were no pictures on the blog/email so that I could easily print the study without pics. I often do it in my bedroom upstairs, while my computer is downstairs. Also, and this it out of your control, I wish that BLB had an app for Kindle. 1) As others have already said, it would be great to have an option to use the study offline. There are people I would love to give one of the books to, but they don’t have internet access in their homes. 2) Instead of having a day at the end to summarize each lesson, which can be overwhelming to many, suggest that each day the one studying writes her own summary of the lesson. Then on the review day at the end, she could quickly look at her summary to refresh her memory and then complete the remaining tasks (consider how to apply, etc.). 3) At the beginning of the study, suggest a way to mark any verses which really stand out to the one studying (something that will not be used later in the study…maybe a star or something). Then when looking back over the lessons there would be an easy reminder that God spoke to my heart about something here. I enjoyed the suggestion early on in this series to go through the “obey” and “children” verses with my kids. It was great to show them the verses about how God calls mom and dad to obey him and them to obey us. In general, I enjoy the suggestions about studies to do with my kids. I don’t always get to do them, but the ones we do are great and beneficial!! One very Important lesson I have learned is from Proverbs 21:5. I had been wondering why I never got any thing from my Bible reading. God answered my question. “The thoughts of the diligent tend only to plenteousness; but of every one that is hasty only to want.” I was too hasty when it came to Bible reading so I was left wanting to learn something but I never did. I loved doing your Bible study. First, this is my first Bible study and you took me through it step by step. Second, I love how it involved my kids. I love that it showed me how to explain lessons to my children. Thank you so much for this Bible study. I will take your suggestions on continuing studying my Bible. (A list is already forming on the topics I want to study.) I look forward to the next one! The only thing I can think of is if we could do an in-person Bible study. Of course that is probably far from possible as everyone doing this study lives miles and miles apart. It would be nice to be able to discuss what we find with each other and to actually see that someone else is doing it too. Thanks again, I really enjoyed this Bible study and with 5 kids it was a great study for me to start with! God has been teaching me a lot in my Bible time recently. But the main point that has been shining through is His steadfast love through all circumstances. No matter what may be happening around us or in our lives, God’s love never changes. I really thought this study was going to tell me all about the magical ways to do this or that to help my children obey. To help them be better children. However, I have a new view of child training. It’s not about how or what I do in regards to their training. None of that matters until I get myself right first. The examples I have been setting are not appropriate and are hypocritical. I have not been leaning on God to help through this, I have not been seeking wisdom and I have not been relying on the blood of Jesus they way I should. Just working on these few little things has helped tremendously. I know my children appreciated my apologies and I am thankful for God’s forgiveness. Thank you Lord for this amazing wisdom! God has richly blessed me through this study. Particularly, I am reminded that 1. God is sovereign– there is freedom in submitting myself and my desires to His sovereignty and 2. The atmosphere, attitudes and behavior in our home must begin with me. Through this study I am convicted that I must model humility and repentance to my children (especially when I am wrong), the importance of creating visual remembrances of God’s faithfulness towards our family, and how intentional I must be to teach my children diligently, throughout the day, using every opportunity God provides. I can’t think of any ways to improve the study…I liked how it was sent to me each day and I can go back over the emails whenever I need a refresher. One thing I did think about was if there was a way to do a weekly study versus a daily study. You could put out the week’s worth of lessons in one email and then people could work on them at their own pace during the week. To help the study: I thought the study was great! I think your explanations of how you teach BLB is great. It is an amazing tool. I appreciate all the wonderful children’s lessons. I also learn a lot from your thoughtful questions. You force us to dig deeper and deeper, even when I think I can’t go deeper. The more of that the better! Thanks for doing the study! As usual God has perfect timing! It’s hard to think of anything that needs to change with these studies. I am so grateful for their cost ;), and the invaluable skill of learning to use the Blue Letter Bible site. The only improvement I might add (and this may already be possible, but I’m just not tech-saavy enough to figure it out), is the ability to print out the lessons. I enjoy having a hard copy to work from and add notes to. Thank you for all of your hard work and wisdom. This study in particular has greatly helped me have Biblical guidance in areas that had nothing to do with child training. Isn’t God’s word amazing like that? I loved the study, and how much more equipped I now feel to venture out in my own study! The only thing I noticed about the study was that the format on the emails would cut off a bit of each sentence. I was reading it on a smart phone, so it could’ve been that issue. Either way, the study was still a great blessing!! This is the second study I have done with you. I have learned so much from each one. But, I was especially moved by the study of murmuring in this study, the contrast between the Exodus passage and Psalm 91. I also liked the word picture of the two camps and the way to illustrate that with children. Such a good word picture of where were choose to dwell. I have also used that in my conversations with other women. Thank you. As to improving the studies, they are so very good. My only problem is that I always want to spend more time than I actually do. The children’s lessons help to visualize the concept and I appreciate that. God is teaching me how much it grieves Him when I let sit fester in my life! I love your studies, especially the creative ways to reach the children. I’d love more ways to reach the children as that’s a difficult thing for me to come up with! 1. God has been teaching me about meekness and that meekness really comes from accepting (cheerfully!) whatever God has for me at any given moment. When things get hard, meekness is bowing to God’s will, not mine. Mothering has been such a wonderful journey… and a big part of that has been realizing that as I raise my kids, God is raising ME! God is good, He is in control and even if circumstances are “less than ideal” (in my own eyes) I can TRUST GOD! Although I “know” in my head, my heart lags behind… being reminded to put God’s Word in my head and heart daily helps me to give instruction to my kids in a way that pleases the Lord. Letting His Word work in each situation is key… I don’t have the answers. God does and if I would get out of the way and let the Holy Spirit do its work, training would go more smoothly without the anger that it often results in. Great study filled with lots of good resources…the only thing I wish we would have done differently (that I can certainly do on my own) is to take apart more verses. I love diving into verses but the sheer volume of the recommended verses to read was a lot. Perhaps if we just took a few to really focus on would have been more helpful. But it was a great study! Thank you for serving us mamas this way! Through this study, God has been teaching me that my example of obedience to Him is very important. If I am going to successfully teach my children to love and obey God, first they must see me model this behavior consistently. Thank you so much for this study. It has started a transformation in my personal walk that I pray will spark the transformation my children need in their hearts. 2. I appreciate you helping us use online tools for Bible Study, but one struggle that I have is that I want LESS screen time when I am at home with my kids. The computer has to come out for paying bills, research for homeschool, email, co-op planning, etc. It would be nice to have Bible Time not be on the computer. I do really, really love your studies, though and God has blessed our family so much through your studies! Thank you so much for sharing with others (for free!) the things God puts on your heart! The Lord has taught me a lot about the example I set for my children. I need to look at myself and correct myself to be able to best lead them. Ive enjoyed being able to teach my children from what Ive been learning. The study is excellent in its current form – the only suggestion I have is to take the children’s assignments and combine them into one document. This is a study that naturally flows into application for our children, and I am planning to go through just the children’s parts with my kids during August. (Their own mini boot camp, if you will.) This will allow me to review the information I learned during July, as we complete the assignments together daily. I copied and pasted each day’s children’s assignment into a Word document, and I plan to print it out and keep it in a notebook for our daily studies. We’re starting day 1 this afternoon when my daughter gets home from pre-k. I know God will use this material to bring about lasting change in my children’s hearts and behavior. Thank you! The important lesson I recently learned from one of your studies is that I cannot expect desirable godly behaviors from my children if I myself am not practicing them, “Practice what I say, not what I do,” if of no good use! He’s been teaching me grace for myself and for my kids. Suggestion: Publish this study in book format! It was awesome. Thank you! Often times I get caught up in the correction and miss the opportunities to build up!!! What would I suggest for making the study better? At this moment, I can’t think of one thing!!! I will say this is my first experience with the Blue Letter Bible online, and I LOVE it!!!! Thank you for introducing such a helpful tool to our family!!! The lessons are well constructed. If I had any comment for change, it would be that Scripture references be provided, maybe at the end in answering some of the questions. I can reference lesson 6 of the obedience lesson. I spent nearly 2 hours on that lesson looking for 5 actions, only after reading all the Scriptures to determine exactly which verse I was to be focusing on. I finally went to Facebook page to make sure I was looking at the correct verse, as I was not confident I had the correct verse. The Lord was gracious enough to awaken me an hour earlier that day, and now I understand why. 🙂 Good study! This study reminds me that the lessons I most want to impress on my children’s hearts are the very lessons I need to apply to my own willful heart. I’ve learned that the training that has to take place first is that of my heart, then my children will see and hear the character of Jesus. I d ok my have any suggestions for improving. It has a very good format and is rich in content. One important thing that God has taught me is that he is a sovereign, loving, merciful God that even when I fail I can come to Him with a humble heart and He will always freely forgive me…With that said, he has set the example for what I should look like in the same aspect of training my children. That I should be loving and merciful and give forgiveness freely when they fail so we can move on in becoming more Christ like. I should not be upset or impatient when they fail my instruction, but loving and gentle in guiding them to the foot of the cross and moving on in God’s love and guidance. THIS was an amazing lesson I needed to read and learn! Thank you Lord! This study was amazing!! I have never had a study like this and it has given me a new light on how to study different topics and sections of my Bible with brand new eyes! One thing I would love to see is a printable format. I printed out everyday the emails that were sent to me for the 30 day Child Training Boot Camp so I would write notes and tuck away for future reference in my 3 ring parenting binder. If this were in a “easy to use printable format” I could have less paper to use and more areas for note taking =) (It would average about 3-4 pages to print per study day when I would print the emails). I love this study thank you so much!! I am reminded to lead by example. I see my own behaviors echoed in my children (both good and bad) and it’s been a hard lesson. It would be helpful to include links to all previous study days. Obedience myself, ouch!!! I always identified as a secret rule breaker (a law abider tho!). But even in the silly rules at work and elsewhere, I’m disobeying God by ignoring those rules and doing what may make more sense to me. God wants us to be obedient even in the little things. He tells us in the Word that we are to be obedient to the authorities placed over us & that includes our bosses or workplace rules. If I am to expect joyful obedience from my children I need to live that out myself in the littlest things as well as major ones! I wouldn’t change anything about your studies, Pam! Thank you for being a Titus 2 woman. Part of me wants to say have all the Bible verses listed, makes it so much easier to read and study when you’re somewhere that you can’t use your phone or computer. Buthe really I LIKE that you make us go find it ourselves, study it for ourselves. It teaches us how to study on our own 🙂 & that’s something I’ve always struggled with. So thank you! Through the 31 day child training boot camp God is teaching me to speak to my kids with more love and respect. Check my attitudes and strive to seek God with more diligence each day. Use so much ink from my printer, or, have an attachment to a printable page without the graphic. One thing I learned from the bible study is that my children deserve the same respect, grace, and forgiveness from me that I continually receive from my Heavenly Father on a day daily basis! I learned about not expecting perfection from my kids about rules, but rather guiding their hearts and lives to see why we do what we do and how Jesus is Lord over all we do. How can I show my children his grace and mercy without giving it as well? This was a biggie and one I know I fail at constantly! I’m praying that the Lord will change me more, so I can show my kids how they may know him better! I think they studies we’ve done have been greatly beneficial! They keep me on track for studying God’s word daily. I do like a little more of a question and answer type study at times, but I still enjoy the way you’ve lead these! Thank you for your hard work and encouragement to me! God has taught me recently to have a gentle spirit in all things…even child rearing. It’s so different from the angry yelling voice that wants to come out when there is fighting or chaos! One thing that is really striking me (from my reading last night) comes from Jeremiaj 23:14. Am I strengthening evil doers or building the kingdom? There really isn’t middle ground. Sometimes I just want to let my guard down or tune out…but…can’t be doing that. He does provide rest anyways, and that’s the rest I want. Now, if I can just remember that. A suggestion for improvement, but maybe not a possibility would be to offer the study as a download. Either at the beginning or by weeks or something. I realize that may not be a possibility, but found it really helpful when I was able to download the Colossians 3 one, print it and work through it that way. Based on the life of Jairus, I’ve learned that my walk with Jesus should not be thwarted because of people who stand in my way and mock or because of seemingly “factual” information that makes my walk with Him appear to be foolish in light of circumstances. I don’t know that this would improve the study but I have a hard time keeping up when we use so many online resources. I do better to have something I can print out and then use scripture to answer so that I can carry it around my house all day long and work on it when I get a chance. The location of my computer keeps me away from the children if I want to work on my study, which is fine if I’m finished before they wake up. But on days where I’m not finished when they wake up I can’t do it. What is one important lesson God has taught you recently as you study the Bible? That the Bible isn’t about me. It’s not an instruction manual for me. It’s a history about Him. What a cool way to read it!! What suggestions do you have for improving this study? I saw someone post printouts. I agree with that. I learn better that way especially since j don’t have a computer and I try to do everything between my iPad and iPhone. Having something I could print would be awesome! One of the things that I learned was the importance to teach my children that they can do nothing apart from the Lord. We are not able to change or act rightly or even love the Lord without His strength and Him giving us the ability. Thank you for this wonderful study that was so timely in our home! I can’t really think of anything I could suggest to make the study better. However, I do think it would be great published in book form like the others you have done. Instead of 30 days, though, maybe lengthen it to 45 to allow for more in depth studying and meditating on the verses. As always, I have enjoyed this study and thank you for the time and commitment you put forth! I’ve been convicted lately to focus on loving my husband and children. Titus 2 says that the older women are to train the younger women to “love their husband and children”. Apparently, it’s not something that comes naturally if we need to be trained! 😉 So, that’s what I’ve been learning: to love my husband and children. What I have learned recently was in regard to the word studies. The fact that the word murmur and the word to lodge mean the same thing! And the word obey is the same in Matthew as it is in Ephesians!! I haven’t had a chance to do the “30 days of child training boot camp”, yet. Boy, do I need to, though! To get an idea of the lessons, I read the one on “whining”. We have an over-abundance of whining and complaining in our house! It’s not just the children, either. =( I have thought about that before- that when we complain and whine we are complaining against God, not just our circumstances or other people. Anyway, I can’t think of anything to change with the study. I noticed a couple others mentioned printouts. Those are always nice, and downloads, so you can have something to refer back to later and jog your memory. I like how you put in activities for the children in the Bible studies. Back with the Prov. 31 study, there were videos demonstrating flax and wool spinning; the children really enjoyed those (I did too)! =) Keep up the good work and thank you for encouraging us “Busy Mamas” to stay in the Word! I am learning to slow down and take time with God no matter how busy I think I am. God has recently been teaching me hope. I’m a pessimist and good at imagining the terrible things that I’m sure will happen, but in reading the Bible recently I keep seeing how God’s people were really in situations as bad as anything I can invent. But God preserved them and made them able to trust and hope and rejoice in Him, not despair. Even if terrible circumstances are coming I can still have hope because God will still be good and still be with us. I started the Boot Camp, but was unable to finish it. I will get back to it, though! However, I have been studying the fruit of the Spirit. A couple things that I have learned. Fruit is singular, not plural, implying that as Christians we should be bearing all nine fruit, not just one. Longsuffering, in particular, is one I have a hard time with. We need to be quick to forgive and be gracious to those that hurt us. I have enjoyed the Busy Mama studies I have done. I can’t think of a single thing that can be improved. Thank you for all the hours of hard work you put into these studies. I can’t wait until this one is in print. In studying Philippians I have learned to have joy in all circumstances and to rejoice in the Lord at all times. Through this study, God really showed me how I need to use my tongue to speak wisdom and not to tear down my children so much…and also to work on our speech within our family from sibling to sibling. Something that we plan on implementing was what we learned from the first few days…we are going to have a feast once a year on the anniversary of when God answered a major prayer request. I’d also like to start some sort of memorial to keep track of answered prayers. 1. It is SOOOO important to be studying and learning God’s word. Learning to LIVE God’s word WITH our children. Strife MUST be addressed and dealt with in the heart. Our speech is critical. This is an area I want to study more and work on obeying God. We are ONLY to speak what builds up. 2. Parents today have never been taught what godly discipline looks like. I feel a boot camp for training children should also address this. Done right- physical punishment is rarely needed, but at the appropriate time is very essential. It is so foreign to today’s society, we need to know what God says. Thank you so much for all your hard work. I have thoroughly enjoyed the study, and sent it to my children to use with their children also. God bless you in all you do! I am learning how important it is for me to rely on God and His word to direct my discipline. Also, I am learning a lot about myself and areas I need to grow!! When I feel disquiet, God always offers peace. When I feel hopeless, God gives me hope. When I allow God to fill me with His peace & His hope, they will spill out to my family as well. There is no situation where I cannot put complete trust in the One who loves me, my husband, and my children more than any other. Something the Lord has been teaching me is to abide in Him by abiding in His Word. I need to find more ways to get the Bible inside, regardless of how busy I am. As for improving the bible study…I would suggest to make the studies shorter for individual days and longer overall. I found it really hard to stay caught up. I know we can go at our own pace but with my personality it just felt like failing so I gave up…with every intention to pick it back up and get caught up, but I never do… Smaller studies would be easier to stay caught up. Typically by the time I read the email, decipher what to do, and do it, it’s been 30 minutes+. Just my thoughts anyway. I still love these studies and will keep attempting to do them!! Studying the Bible in depth has proven to me that the Word of God is true. Every. Single. Word. If I saturate myself in the Word, that’s what comes out when I am discussing heart matters with my children, myself, and even my friends. The Busy Mom’s Boot Camp has brought such conviction for me personally of things that I need to change before I can expect to see improvement in my children. Also, one more thing. If I just use phrases “talk nice” instead of the Word “only use words that encourage others”, then the Word has the power to make the heart change in the child whereas the phrase doesn’t. Thank you for this study. I am hoping to enjoy many more. One important thing that really hit me between the eyes is that when everything in my life is so chaotic, I need to look at my relationship with God (the amount of time spent in His word, in prayer, etc.). I realize that my relationship with my family, homeschooling, and everything in general suffers tremendously when I don’t spend time studying His word. I lose focus. It’s hard to make decisions. Then I sit there and wonder why nothing is going right. Everything I do is in the flesh. This happens over and over again. This time it was different. A light bulb went on!!! Thank you Jesus! The Child Training Boot Camp study came at the perfect time! God used this study to remind me that it’s my children’s hearts that need dealt with not just “fixing” outward behavior. Also, just reaffirming my role as a parent “to walk in a manner worthy of the calling to which you have been called” (Eph 4:1). I really enjoyed this study just the way it was. I tend to prefer having a hard copy book with the questions listed out to write in, so I may have to pick up a copy of that once it’s published 🙂 I had never used Blue Letter Bible before so it was great to better understand how to use such a useful resource. Okay, I will be honest. I am so behind on this Child Training Boot Camp Study for Busy Moms. I got overwhelmed with an email coming every day, especially with all the other emails that inundate the Inbox. I am not connected to Facebook. That is something that I feel the Lord has personally convicted me about. He knows and I know that it would be too much of a time waster for me. I have only one suggestion. For those who really, really want to do the study but can’t do it everyday, can you provide the entire thing in an Ebook or PDF document at the end of the study? I don’t know if this can be done and be able to provide the links with it. This document would contain all your blog posts with links. Thank you and God bless you for taking the time to put this together and sharing this with us!! I have learned that that why my children are acting a certain way is more important than how they are acting. It is easy for me to get caught up in the constant correction of my 2 and 3 year old and not step back and ask why they are acting a certain way. I need to look more into their hearts than their actions. I would love to have the children’s assignments as a separate ebook so I could use it in the future when my children are a little older. I am learning that Christ redemption of us (the church) brought us together in peace and that my opinions on peripheral things shouldn’t be more important than keeping the peace and keeping my brother from stumbling. My answer to question #1–I never thought how my murmuring and complaining was showing my discontent with what God provides for me. He definitely knows what is best for me and when I need and if I need something. Grumbling doesn’t show my faith in His provision for me. I need to show my trust in God by accepting what He gives me in His timing. At the start of the study I didn’t understand that this was one of your inductive Bible studies that I usually always do. I was thinking it was just a blog post on Child Training ideas. Maybe make the blog title say something about Bible Study instead of Boot Camp. Thanks for another great study. My answer for question #2–I really enjoyed this Bible study–my kids are actually grown with children of their own. I still wanted to do the study to see what I could apply to my grandchildren when I am with them. I think it would be nice to have the lessons in workbook form, but I guess that could be expensive and some wouldn’t be able or willing to do the study if they had to pay to get the materials. Maybe it could be offered to those that would like to keep the study in a book form. I have been learning that awareness of God and others is closely intertwined with awareness of my own dependence on God. It doesn’t look like it makes sense when typed, but it is really on my mind as I go through this study. I cannot do this parenting thing without Him. When I try, I *will* fail. I need to get my head and heart right before attempting to discipline and disciple my children. I didn’t get far in the study. I love that the blog posts are up for me to go back and keep plugging along. I love the practical suggestions you give. Improvement could only be more of those very down to earth examples, activities, practical applications from every angle possible. I have always been thankful to ‘borrow brains’ as sometimes putting a high principle to practical use is lost on me without someone giving me more of a list of applications. Lately I have been learning (over and over!) how important it is to address the root issues of a problem and not the symptom. For quite awhile, I have been getting very frustrated because I felt like I was an “angry mom” and the nothing I could do would “fix” it. But now I’m realizing the anger is a symptom of the selfishness in my heart, and the triggers are usually caused by my laziness in training my children. 🙁 Hopefully now I can address the root issues and see a change! The Bible is sufficient for every area of our life. I just need to make it a priority in my life. It takes work to do that. As for changes, I absolutely LOVE your studies! I love how you don’t spoon feed us, but give us the resources and a little head start, and let us go! 🙂 As for this particular study, the only suggestion would maybe be to modify how you did the topical studies (where we had to look up a bunch of verses). It was great information, and I got lots out of it, but it seemed like those days threw some people off track since they were longer and more involved. God continues to teach me through Bible study and through daily living to keep on trusting in His perfect will. We just lost our precious son through miscarriage a few days ago. God is good all the time. He loves me! What a comfort it is to rest in Him! I got so much out of what I’ve completed so far. The main thing I’ve discovered is I LIKE to dig deeper into the Word. Just reading the verses is great and clearly necessary, but I love digging down to the Hebrew and Greek and seeing the deeper meanings. I also LOVE that you don’t tell us WHAT to think, just what to read. thanks for all of your hard work!!! As for suggestions, I think adding to the section about involving the kids would be great. I’d love a couple activities to do or choose from that can include my husband too! But, I LOVED the study (this was my first one by you) and look forward to doing more in the future!! Thanks!!! 1. The more I study, the less I know. I’m learning about the unfathomable depths of God. 2 This is not a 10-15 minute study. I would really like a section for 10-15 mi Utes AND questions for more studying AND children’s activity. By separating into sections, it might help so many not to feel overwhelmed. I’ve done all your studies, but have never completed one within the month. It can feel like failing to keep up, but if there was a daily section, more in depth and involve childten/family, I might be able to complete it. Doorpost has encouraged me for so many years, I can’t remember when I found you. I am grateful for your energy, thoughtfulness, and kindness to share your knowledge! Thanks! I have been learning to check my attitude first and to give abundant grace along with any training. My suggestion for an improvement would be to have a few more questions to answer each day. I know a lot of people like open-ended studies, but I like to answer direct questions. God is teaching me these 2 weeks that He is control and that I need to work on patience. It has been hard for me to depend on other for help. I am a work in progress. Thankfully God has not given up on me. That God’s Word is alive. You can study one passage one year, and the next year study the same passage and learn something new! It never gets old or boring!! An important lesson God has taught me lately is that I need to remember that I am an example to my children. I cannot display defiance and disobedience and then expect any better from my children. answer #1) the Lord has been showing me that I need to address the sin issues in my own life if I want to see my children really grow in that area of their life. One important thing that God has taught me is that he will always work things out according to His plan. He will never leave you hanging. Just trust Him always, even when things get hard, and remember that His way is perfect. I don’t really have anything that I would change, other than maybe move a little slower. But, I have learned that if I want my children to change a behavior, I have to look at my own first. Answer #2) keeping the lessons short? it’s a hard one to even suggest though, as I really don’t mind having to take a few days on the longer lessons. I appreciate your teaching! That God’s Word is ALWAYS relevant and pertinent to me right now! We learned how God teaches us to come out on top in many different situations. For example, when someone is upset with us, instead of taunting back or justifying yourself, softly answer. It will calm the situation rather than escalate it. That goes with our parents, siblings, neighbors, and strangers. I have been reminded that we all have circumstances in our lives- good and bad. God is there in the midst of them. I can trust Him for everything and with every part of my life. God always has my best in mind. We have not done the study yet. We are still trying to understand brother offended and how to apply it in our family. They’re seems to be all kinds of quotations and then self righteousness. It comes down to tattling that the other person didn’t follow the chart. Did you study Matthew 18 with them? I don’t know if it would help, as it might depend on the ages of your kids. I vaguely remember hearing some parent say they stopped tattling by applying Matthew 18:15 etc. The parents required both kids to be present for the children to tell the fault of their brother, and also encouraged them to try to talk to each other first. My kids are little, but I’ve been working on coaching “use your words” when they are upset with one another. I guess that is training them for when they will later “go to your brother and tell him his fault between you and him alone.” I have yet to see how it will work out fully, but it seems they do play better in the next room than they used to (praise God!). Maybe lessons could be shorter or for a longer period of time. So much good stuff in the lessons. They take a lot of time as I search BLB and do cross referencing. So much to gleam from each study. I hate to skip any part of it. I have been hearing and reading that if I want God in the lives of my children, I have to invite Him into my heart and life actively. I didn’t do the Bible study because I didn’t know about it but I’ve been sort stalking these products and there are a few I really wanna get but haven’t pulled the trigger yet. After reading some of these comments I really want to read this study because several people’s responses were right along with what I’m working on with myself. The Lord has taught me so much lately that my response is often what my children mimic and the more I recognize that the more I notice it on my children. I need to be slow to anger and show the fruits of the spirit more to my children if I expect that of them. I’m continually reminded that MY heart, attitude, etc. must be right before I can effectively train up my children. I want my boys to see me living a godly life rather than just teaching them to. Short lessons are so helpful for busy moms. I have been reminded that God is with me. I don’t know about suggestions. The only thing I have a hard time getting everything done in one setting. It needs no improvement it is my favorite Bible study ever! I have learned so much even though I’m not finished. So glad to have learned about BLB. The Lord has shown me that my obedience needs to come first. No matter what I say it’s my actions that my children are learning from. Putting God’s word first is most important. Thank you for this study! No suggestions for any changes. I really enjoyed the study. Although nothing was really new, I think that we all need to be refreshed in our walks with the Lord. Especially knowing that other parents are dealing with the same issues that we are. It is always the best when the instruction comes from the Lord’s Words that are saved for our use and instruction. Sometimes growing weary is easy because the task seems so great…but…BUT…:) There is no greater task than what the LORD has given us. In each of our children He has given us a great responsibility and blessing. If we do not take the time to mold them we are failing in our duty that the Lord has blessed us with. When we look back…how will we see our teaching? Through God’s words or through our flesh and what we thought was the right way, good enough to get by. Thank you so much for your faithfulness and preparedness. Thank you for being a Titus 2 Woman, ready and willing to teach us ladies. As for suggestions… says the lady who doesn’t make her own studies but follows a wonderful, godly leader who has done the research for the researching for me and all these other ladies to look into God’s Word ourselves… who am I to make suggestions? You have done a great job formulating the outlines each day into doable portions of a time frame. On the days that “I don’t make the time” to be able to complete the job, I know that I can come back to it later in the day or night to finish the task. I also just leave a blank page to come back to in my notebook. It is usually my not making the time that makes the devotion time incomplete. I think a reasonable amount of work in God’s Book is never a bad thing. Years ago our Pastor had us write down what we spent our time on for a week. It was amazing to see how really little time in the 168 hours that I was spending in God’s Word, studying it. how much more time I spent on reading a book, talking on the phone, sitting at the computer or watching a show. If we want to learn a new skill, it takes time. Getting soaked in God’s Word is a skill that takes us making the time to do it. Amazing when we take the time to search out God’s Word, how we thirst for it. I love how you add things to reinforce it with the children. Small things that even in the middle of the day come to mind to apply to their and my own lives. Thank you so very much. I have been constantly reminded of how gentle Jesus is with his disciples, and how I need to gently yet lovingly train my kids in truth. I tend to expect my kids to somehow have it altogether, when in reality I am a daily mess in need of Gods grace. I am also learning of Christ’s love for me, and how I am considered righteous before a holy God because of Christ. I love your studies! However I tend to start and then get behind. Maybe having the study be 3 days in a week instead of 5? Such wonderful content directly from scripture. Thank you for this! God has opened my eyes to the TRUTH that has set me free as a parent. I have learned to go to his WORD to find answers in my life as a parent and not only in quick fix formulas. The Busy Mamas Study has taught me great skills in how to study the word of God. I am so excited to jump into the word now! Thanks to you! New learning is more of a reminder … that I can’t point my son to Christ unless I am walking with Him myself. And I can’t expect behavior better than mine. Suggestion = said by some others, but perhaps having 3-4/week for those of us who get behind. I will go back and catch up now but there is a small amount of guilt when the new daily email comes in & you haven’t done yesterday’s. Although I haven’t finished this study yet one thing I have learned is that my own behavior and attitude is so important as an example to my children. I love these studies although I tend to fall behind, like others mentioned perhaps another catch up day? While I love using Blue Letter Bible sometimes I do my study when I am waiting for lessons or activities to finish and do not have internet access which is one reason I fall behind . One thing I have learned recently is that in order for me to be a good mom I have to have a good relationship with the Lord in order to do his will and have the fruits of his Spirit. Otherwise I am trying in my own efforts which is in vain. I would like to be able to print out then entire study so that I could have it on paper. I get distracted when I’m on my phone or computer doing my study. Also, I like having something tangible to take notes on and highlight certain points so that I can go back and read when I need a refresher. There has been an area in my life where I haven’t fully trusted in God and have tried to control the situation. Recently, He has opened my eyes to it and I have been taught (again) to fully trust God in all things! One thing i learned in this study was about discipline. Before i always viewed it in a negative light. I felt like if i was always getting onto my kids or punishing them how would they know i loved them. This study brought to light for me that discipline is about training, teaching, growing their character. It doesn’t have to be harsh or mean. It was a really big eye opener for me but i am excited to put some new practices to use in our home. Question number 2. I have a hard time being on the computer. I am so not a technical person. While i love the bible letter bible it is a lot for me to figure out/ handle (even though you give great instructions Pam!) Some times i just want to print the study off and sit with my bible and not have to have the computer or an app turned on. So while i love the blue letter bible if we could use it a little less I would like that. Maybe just have some days where scripture is listed for us to dig into and then have an optional blue letter bible part to the study….because it is good, every day is just hard for me personally. Hope that makes sense 🙂 One thing i LOVED about this study though was how involved everyone was on facebook! That help a lot….and the discussion was great! I have loved this study! Not only have I learned so much about training my children, but I’ve learned how to use the Blue Letter Bible, which will help me study other topics on my own. Thank you Pam for putting together this wonderful study! Will you be putting the study into a pdf format? I think doing my Bible Study offline helps me be more focused and less distracted (by emails, etc). I really liked the children’s study. One suggestion: I think having a link to all the previous studies (day 1, day 2, etc) at the end of each day would be helpful so we don’t have to scroll down to multiple pages if we missed quite a few days worth of study. First, I determine to fix God’s word in my memory, understanding, thinking, character, desires, appetites, and emotions. Then as a sign that I remember them, I will actively practice them. The result will be strong neurological paths in my frontal lobe (bands between the eyes) regarding those commands. One of the greatest lessons I am learning is that I must live and parent and love out of who Christ has made me and created me to be. The Eph 1-4 study on what God did has been game changing for me in my perspective of myself. I do not have to focus on my faults, but I do have to focus on the amazing work God has done in me! He has redeemed this mess. I am therefore blessed! It has changed the way I am doing all of life! Changes…none! I have loved how bite sized the lessons are. I have been so grateful for the teaching on using blueletterbible.org. I have absolutely been so grateful for the creative children’s applications. My only question is can I use your material to teach a class from your study if I send people to your site to do it? Thank you for your work. It has been a breath of fresh air!! I agree that it is better to go slowly and get it into the life, than to go faster and not apply it! Maybe less material would be okay. On the other hand, maybe the amount of study material is good for a blog, if enough of the ladies are finding it a good amount of study material. The rest of us can go slower. Another idea would be to highlight a small section for those who need a smaller bite, but also include just as much as before so those who have more time (or just want to get all the material slower) can still do that. God’s really been showing me just how deep my works and checklist mentality runs. It’s so subtle sometimes, but it’s everywhere! So I suppose he’s been teaching me what faith really is and how it should look in my life. I have really enjoyed the study. I think the biggest thing for me was the wind and the waves instant obedience. I’ve known that all of my life, but this time the Holy Spirit brought to my mind – “Do I obey instantly?” “Do my children?” What would it have been like if the wind and waves would have obeyed like I obey? The instant obedience by the wind and the waves brought glory to God – the disciples easily saw Christ was in control of everything. So convicting. I wasn’t able to do the study but I love all your teaching. I’ve been learning through my Bible readings that God’s love, faithfulness & wisdom is so much bigger & higher than my own. This is an ongoing lesson I’ve been learning for a long while now & I think I always will. It is something that I see the need for in my parenting as well… to show God’s love, faithfulness & wisdom in being faithful to train & teach my children! I think your studies are great & I follow along by reading through them even when I can’t complete them through many now! Ways to Improve: I live in Africa and like to try to do the study in the morning, but it wasn’t always posted by morning of my time- 6-7 hours ahead of US time. So maybe post a little earlier. LOVE this study it has truly been a blessing to me and my family. One lesson God has taught me recently is to be patient is really simple if we try for that moment and praise Him in the time of waiting. Most often, we allow ourselves time to dwell on our discontentment and discomfort. If instead, we change our perspective to that of praise and thanksgiving, our wait is not as noticeable and we experience more our the Lord in our daily lives. I have not participated in your Bible study, rather been pushing in and trying to learn and develop the Fruit of the Spirit in my own personal life. I actually did not even realize that you had this child training boot camp. I think one way to improve this study would be to post a daily devotional or the main lesson & scripture for the day on your Facebook newsfeed. I normally just look at that after my quiet time in the morning. I think you would reach a larger audience that way. Thank you for the resources that you provide and the ministry I which you serve! Titus 3:1b …avoid quarreling, to be gentle and to show perfect courtesy to all people. One important thing I learned while doing this Boot Camp is almost every sin, strife, argument, angry word, and disobedience is really just a heart issue. Through this study, God really showed me that I have to be doing constant heart checks to get myself right before trying to get my kids right! :). Through His Spirit, I can be a great Mom if I let Him work through me to love and sherpherd my daughter. How my walk with Him and obedience to Him has implications for my children and their obedience. I really liked how grounded in the word this study has been and how it has grown my desire to teach my children as well. I love the activities ideas. I have very small children, so I have gad to be creative with how to relay this information to them. Suggestion: more age-appropriate activities for younger children. Thank you! I have loved learning how to use Blue Letter Bible. It has been great for using it in these studies, but also if I am reading through a more challenging passage of scripture as well. As I have been studying, one of the greatest things I am reminded of is how patient and loving God is with me. I make plenty of mistakes, my kids will too. I need to remember this & take these moments as more of a learning tool then to get frustrated with them. This study came along at the perfect time. I am in the midst of parenting two young girls and have been searching for tools to help me teach obedience and respect. I am not completely finished with the study, but have been refreshed and refocused by the truth that my relationship with God must come first. Leaning into Jesus’ example of perfect obedience is helping me trust and obey and my daughter and I are having sweet conversations about the stories of obedience (and disobedience) in the bible. Thank you for making this study available. Loved this study! I am in only day 18 but the study on speech has been so challenging and convicting! Can’t wait to finish. I also love BLB app and site. The step to step instructions are great too. I really liked your steps to study and your keeping so much to the Word. Perhaps more clearly or more easily able to make the lessons work in 15 min and then the expansion for an hour. Right now it seemed like it was set up for taking 30-60 min and then even more to study. I love the expansion and suggestion for more study but maybe the initial daily lesson a bit more bite sized for the moms of little ones that find it hard to read without kids in her lap or needing to get up every 10 min to help them or get something. 🙂 Thank you for these studies and the love and work you put into them. One important lessons I’ve learned from this study is that obedience in my children starts with me. I’ve realized that I have become lax in obeying my husband and I see this reflected in the way our children obey me. Thank you for all the time and effort you put into these studies and for making them available to us. I appreciate it! I’ve been learning a lot about the importance of godly speech, and that it reflects what is going on in my heart. I have been VERY convicted and encouraged by the scriptures and the study regarding speech. That’s the section i’m still working on. This is the first study i have attempted as well. And i am very blessed by the time and the scripture study you have incorporated in the study. I love going to blueletterbible and digging further. It has encouraged me to use blueletterbible on my own as well. I’m slowly working through the material and have created a new Doorposts Bible Study folder within my email in box. I also enjoy the section on “for your children”. Thanks again for putting this together! I don’t really have improvement suggestions at this time. One of the things this study reminded me, is that obedience should be done joyfully and not halfheartedly or with attitude, grumbling, etc, and that even my usually cooperative teenager still has areas to work in with obedience, and me too! I would definitely prefer to look verses up in something other than the King James version. While I can do it, and understand it, I know it turned some of my friends off from doing the Bible study with me. The Lord really impressed upon me that His mercies are new every morning. I struggle w perfectionism and get really hard on myself when I feel I’ve failed in an area. It was a wonderful awakening to relax and know that when I don’t have it (or even when I do have it) all together – that He does and He still loves me everyday and everyday is a new day. He also reminded me that I need only ‘worry’ about today. When I think about these 2 truths, it has helped me to slow down and not worry about tomorrow, that I just need to focus on loving and blessing and living and growing today. I have learned that I am not grudgingly accepted by God at His throne, rather I am urged to go before Him and seek Him. I am not a second-class member of his household. I am no longer viewed as a sinner. In HIS eyes, I am a cherished daughter. Thank you for this study. I can’t think of something that will make it more helpful. I love to print it out. 1. I’ve recently learned that I’ve gotten stuck in trainin up my child to follow the Lord. I’m refocusing my attention to not just look to God in times of need or when they are acting out, but to praise Him when things are good and to lean on Him then too. 2. My new study I’m going to follow is Plants Grown Up. Its very intimidating! But can’t wait to start it. I like how there are different projects to do hands on learning because thats what my boys need. 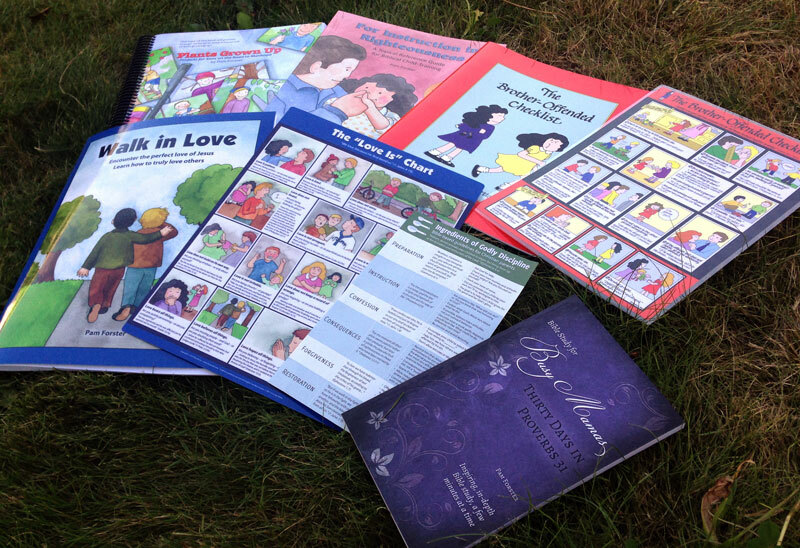 i have been using the Walk in Love study with my children in school this year. We have enjoyed reading and talking together. I am reminded once again that God’s Word truly is the best teacher for myself and my children. It takes time to use the Word of God to instruct our children, time spent reading it ourselves and time spent imparting it to them. But if we take it at its word Scripture itself tells us that it is useful for this very thing! 1. I have learned that God is the ultimate father. He knows exactly when, how, and why to correct and discipline us. God made us in His image and desires us to live by His example. 2. I have loved every minute of this study, and I wouldn’t change a thing. It has been such a blessing to me and has taught me how to actually STUDY the Bible. It has been such a joy, thank you! I’m more deeply learning and experiencing how even during the hard times God holds out a hand in love, a way for us to conquer our issues, fears, trials. The Israelites continually messed up and often were severely disciplined but God always gave them an out, as such. Heed my word, obey, turn away. LISTEN. BELIEVE. TRUST. These are hard for me to do. One thing that God has allowed me to see through this study is that our parenting and training our children at all points begins with our submission and obedience to Him. When we are disciplining our children it puts you in a position to really reflect on how is my obedience toward God and that causes one to be more merciful and gracious when dealing with our children. One thing that I would find a helpful improvement is to only have the study go Monday through Friday each week and let the weekend be a time of absorption and reflection on everything that has been given during the week. There is such a wealth of truth poured out during each study, it is easy to become overwhelmed with trying to keep up that there really may not be a chance for information to sink in and settle in our hearts so it can be useful. The biggest thing I learned or more just keep coming up in my thinking is that I am supposed to fix God’s word in my memories, emotions, intentions…not sure why but to me that is just huge. How would I improve this bible study…The only thing I can think of is make the lessons smaller bites. I realm like looking up the verse and using blue bible site, it just seems instead of taking 30 min it is taking me an hour or more to finish. Then I get discourage and struggle to finish. However, it could be just the way I study. Thanks for writing this study. What I’ve learned from studying the Bible is that there is more to it and it goes deeper than any one human can understand. Each year and each study brings new knowledge and revelation to me. I’ve also learned that my children will learn more from what my own actions are than what I tell them. I’ve been working on your Psalm 37 bible study and plan to dive into the Child Training BootCamp next. One thing that surprised me and really made me think was the definition of fret (hot, to burn, kindle, anger). No wonder we’re advised to “fret not yourself; it tends only to evil”. I’m really enjoying all your studies, and have really needed them this year!! Thank you!! -God has been teaching me that meeting with Him daily is most important, whether its long or short. I tend to not meet with Him at all if I know it won’t be “long enough” or “in depth” enough. -I can’t think of any suggestions to improve the study! It is amazing. 🙂 Thank you! I have been going through the Proverbs 31 study in addition, and I would have to say that God has been teaching me how to tend my family (my husband and children) better than I have been…that this is the most important place to start, and then the opportunities outside of my home can come into play…but only after I have been giving my best to my family! Question 2. I wouldn’t change anything really, but I might add a printable sheet that can be used to answer/journal, with some of the things from the study on it…such as the word/verse we are looking up, etc…with space for thoughts. Helpful hints, etc….your studies really are amazing, and I love how they spur us on individually to answer the questions, and dig deeper into God’s word! I have been learning about submission–complete submission–to my husband, my authorities, and my God. God has taught me to never speed read through His word, He says study to show thyself approved & how can He speak to me if I’m in a hurry? Studying isn’t meant to be fast, it’s time we spend w Him! Learned this while trying to catch up on my daily reading plan & I’ve learned so much by just slowing down & digesting His word! God has been teaching me a lot about pride lately. I realize that pride is tainting my ability to parent my children in the way that God wants me to. I need to get rid of all pride and see my children (in good times and bad) through God’s eyes. I have been saving the links to do the boot camp, but have not actually started going through it yet. I really enjoy audio recordings, so small recorded sound clips would really enhance an online study for me! Thanks! I can say that God is teaching me that in my parenting I was getting caught up in the picky little details and it is the heart that really matters! Connect to that heart and you can connect to your child. As for improving the study, having them all together, maybe with a journal type format so we can record thoughts, etc. could be very handy. I have learned that God’s grace really is sufficient especially as we go through life’s trials. When life gets too difficult or painful, the grace of God abounds to lift us up. I have learned through this studies, that biblical command and principles are applicable for children of all ages and not only for adults and older children. And that we have to find ways to teach them in a childlike manner and to pray that their hearts are for God, from young age on. Every day we plant seeds, water and watch them growing in our childrens lifes. The Lord has recently taught me that self-sufficiency is the single-most hindrance to Him sending me His help. I have a friend with whom I walk in the mornings. We both enjoy these walks because inevitably our conversations eventually center around the Lord, His Word and what He is doing in our lives. On one of these walks a few months back we talked about how self-sufficient we both can be and how this is a hindrance to a life of faith where one truly knows and lives “Apart from Me, you can do nothing”. The other night I had a dream where someone said to me, “You are now the new Principal of P.S. 107″. When I woke, I immediately went to Psalm 107, realizing that the Lord was telling me that I NEED to live by the priciples outlined in Psalm 107. Crying out to Him, waiting for Him, relying on Him is the solution to our problems, not our well thought out plans of deliverance. Proverbs 3 says Trust in the Lord with all your heart and LEAN NOT TO YOUR OWN UNDERSTANDING, IN ALL YOUR WAYS ACKNOWLEDGE HIM AND HE SHALL DIRECT YOUR PATHS”. Perhaps do a quick video with a message for the kids? One important lesson that has stood out to me throughout the study is that if I am getting frustrated with my children’s behaviour/speech it is a sign that it is ME not THEM. I have to first examine myself – have I been slow to discipline, have i not listened to my children, have I provoked my child? Instead of starting with them, I focus on my respone/words/actions in the situation. One thing I have learned so far from the 1 Corinthians 13 study is how we are nothing apart from love! That brought tears to my eyes. I have two suggestions; firstly, if you could please share which translation you are working from when we start the study; secondly, once the study is over, it would be so helpful to have a page, perhaps introducing the study, with all the links to the different days, sort of like an index page with clickable links. I have worked through several but usually not when they are ‘live’ so I have been trying to figure out the best way to find all the days. Thank you for all you do! My kids and I have enjoyed studying together this summer using these materials. One thing the Lord has taught me through this study has been the need for me to watch my words as I interact with my children and to make sure they are sweet and guided by the Spirit. I loved this study. The only thing that might be improved is a more realistic estimate of how long the study takes each day. I found I was spending between 30 and 45 minutes to do all of the things listed (of course, I may have followed a rabbit trail a few times). Otherwise, it was wonderful and just what I needed. God has been revealing to me areas of unbelief in my life and what it means to truly trust Him and not depend on my own understanding or works but on His grace – in parenting and in everything. I really have no suggestions for improving the studies. They work well for me just the way they are. My husband and I started going through the study last night (last month was really busy with his Dad having cancer and passing away last week so I just printed each day’s post and have them to go through). We did not even finish the first day yet. One thing I would like to see sometime in a study is less use of the internet as we have dial up and using the Blue Letter Bible. We are going to try using WordSearch and do the study. This is a free program with a lot of bible study resources. I am sure there are probably others who can’t access the internet well and this may be a help to them as well. Thank you for the wonderful encouragement to be in God’s Word daily! I was struck by the little study on Ephesians, highlighting how much God has done for us, so that the instructions/admonitions in the last half of the book should be a privilege, not a burden for us. What an amazing — not oppressive — God we serve! The Lord is teaching me two things… again, He is so merciful! Praise The Lord all the earth! One, I need to be close to Him. In His Word, in prayer, constantly seeking Him with my whole heart or everything I do is in vain, a chancing after the wind. Two, I need to be loving my children always, just as Christ is always loving me. Teaching them His ways, both by His Word and just as important, by my example. Loving them in both word and deed. The Lord is continually teaching me to trust Him in all things. If I want behavior to change in my kids, then I need to make sure that my heart is right first. These Bible studies are great! My problem is completing them. I fall behind and feel overwhelmed with trying to catch back up. I have to take them really slow. This study has really helped me to examine my heart and my motives when it comes to parenting. It has also helped me to make the study of God’s word a priority. I appreciated having a reminder post on Facebook. I don’t access my email frequently so this helped prompt me to study. What God has taught me through this Bible Study especially, is that if I want my children to be obedient, to not talk back, to be kind-hearted, to be the proper example for God, etc…, then I have to be those things. As I did the study, I saw all of my flaws in the complaints I have about my children. I cannot expect more of my children, than I expect of myself. I have to not only teach with my lips, I have to train with my life. One important thing that God has taught me is the power of our words. Not just my kids, but my own words. I have been focusing on seasoning my words and not just speaking what comes to mind. One thing that could improve the study is giving more scripture references. When you direct us to go and search something and study the scriptures that come up it would be nice if you list a few key verses. The Lord continues to remind me how vital it is to pray before studying His word. I find that if I just try to jump in myself without asking the Holy Spirit to reveal what God wants me to learn I struggle and miss out on valuable lessons. I love these studies! 🙂 Even though I’m only about half-way through… I got side-tracked in Eph with Jesus’ obedience and ended up doing a study in that, but I saved all the posts so I can go back and finish them. It’s been revealing to me how SLLLOOOOWWW I still can be at obeying God, yet expect quick obedience from my children. Ouch. I’ve learned that you’re never too busy to read your bible and if you are that’s a problem. Gods word is intended to give us the answers and be a resource for troubles in our lives. I’ve also learned that it’s better to be proactive that reactive as a parent. I loved talking to my children about things and as they got into spats with each other we were able to quote memorized scripture to remedy the situation. God revealed to me that it can be done but I have to be intentional about studying and praying and listening and obeying. There really isn’t anything I could say to make the study better. I got caught up on about day 15 or 16 when we had to read about Speaking Wisdom within only because I like taking copious notes and wanted to write each of the scriptures out and I fell behind but other than that it was perfect and practical for busy mamas and busy babies! Lately God has been reminding me that He loves me and I don’t try to please Him in order to earn or repay Him because I can’t. I obey because He loves me and I grateful for all He has done for me. I suggest less memory verses. 1 or 2 for each study is good. I wish I could do more. I know it’s a good idea. I cannot save my children. I can do all these great things and it still doesn’t mean they will accept Christ as their Savior. Only God can do that. This is unrelated to this study, but I’ve been learning about how I can love my husband but not really show him respect. I’m praying for opportunities to show respect and awareness of when my tone or actions are showing disrespect. I love all of the studies but sometimes feel like the amount of research is too overwhelming. I want to do it all but if I feel like if I can’t finish it then I shouldn’t start. One big thing that I learned from this study is that I have to deal with my obedience, speech and other heart issues before I can ever expect my children to. I’m a teacher (now homeschool mom/part-time college prof) and I understand the importance of modeling, but looking at the Scripture and really taking to heart that it’s what God commands of us to do really hit home. I loved this study and it did take me sometimes several days to get through just one day on the blog, but it was what I believe Bible Study should be. I would suggest incorporating some Bible verses to memorize each week. I could have easily picked a few, but having a few suggested would be great! Bible memory is so important! #2 – for the Busy Busy and also scatterbrained moms of us…maybe have an even more condensed option – like a single first paragraph that summarizes one top point you want to communicate. If there is time in the day for more, great, but if the kids start arguing after you have had one minute at the computer only, then at least you can meditate on a “small thought” of the day (perhaps also listed with one key verse printed out). Of course you can encourage deeper study for later! God is teaching me through His Word that I need to be in it more! I have learned that there is comfort and strength in God’s Holy Word. God keeps His promises therefore I can have peace in the storm. I am learning and praying about controlling my mouth. It is the same problem my kids have and I can not work on their heart problems with out working on my own first. We have been memorizing scripture and studying God’s word. I love how this study leaves me with not only great notes to look back on but also tools to use like the blue letter bible. I have used it numerous times since I started this study for all kinds of things. thank you! I do think that some times if I don’t use the KJV I don’t get the right answers. It would be nice if the “answers” or at least the correct verse references were posted somewhere because I don’t think I got the right list of verses in my searches some times. I’m learning about God’s Grace & his suffiency!! I need to remember that my children are being sanctified as well. They to are growing in there Christian walks so when I am frustrated with their behavior I need to remember the victories God has given them and trust God in the process. Thank you for all of your efforts in equipping others in their walk with Christ, specifically where I find myself in so much need for wisdom in bringing up children for Him, and being the helpmeet I was created to be. My husband and I are being challenged to endure a time in our lives that has really put us to test for over a year now. Just previous to that, my oldest daughter and I spent about a full school year studying Moses. What really struck out to me was during the exodus when the people kept complaining, even after all the miracles they had seen with their own eyes. Their unbelief seemed unreal to me, and their lack of ability to endure it all. But as I started to try putting myself in their shoes I was able to tell that I most likely would have been one of those people. It has been beyond what I can handle in my own strength this year, our circumstances. It has been more blessings than I could explain, and yet more than I can handle on my own. I am relying on Him for strength and all else. I am being reminded of those people again, and again, when I complain in the midst of all the blessings. I think to myself that I wouldn’t want my story to be read about like theirs. I want it to be different, I want it to be better. This has been a very important lesson that started out as a study between my 8yo and I and has turned into a real life lesson for me, and my husband as well. It’s a lesson that will reap changes in who I am, and will affect our legacy and generations to come. I am thankful for it all. This will be my only reply, as I am fairly new to your blog, and although I tried starting one of the studies a few months ago, only getting as far as lesson 1, I have not had the chance to continue with it yet. Busy, busy only begins to describe it! Numbers 6:25-27 I learned that God smiles upon us by His sending the world Christ to die for our sins. The only suggestion I have is to include a Psalm or hymn to sing that corresponds to the study. We sing psalms so I was thinking the first part of psalm 23 would be a great theme Psalm for this 30 days study for busy moms. If you were to sing it every day it would be memorized by the end of the study. One important lesson I have learned is that I need to be in the Word daily. I’ve done a few studies here and some through another site and no matter where I am studying, I realize the seriousness of being in the Word every day for spiritual growth, spiritual reproof and reminders of God’s love for me. Thank you for the giveaway. God has shown me through reading Proverbs 10:13 that the rod is for the back of one who lacks understanding. I had been thinking and dealing with discipline issues wrongly. I thought I should not use the rod to correct my child unless he/she fully understood what they were doing was wrong, but God has shown me that I have not been diligent to discipline as his word instructs. Yes, discipline is far more than the rod, but God has said to use it and I plan to be more faithful with his power and strength. I have thoroughly enjoyed the Bible study and am currently not finished yet as it is taking me a long time to finish. Hopefully it will not be gone before I finish. I was already involved with another Bible study when it started, but I felt the Spirit’s prompting to do this one as well. So, the only thing I would change is maybe one more catch-up day to make it a five day study. However, I have 5 really young children and maybe if I wasn’t doing another Bible study it would be fine to leave it the way it was. I am thanking God for you. I have not finished the bible study yet. But so far what has stuck out to me is the need for us as parents to do our part in staying close to God with prayer and bible study before we can train our children. Also the the part about (whining/complaining) where are we dwelling? Are we dwelling on what is not right, “murmuring” or are we dwelling in God’s righteousness, in satisfaction? Those points really stood out to me. I really am enjoying this bible study. The only improvement I can think of which is not really a bad thing, is that some of the days seem really long and in depth for having 2 small ones. Like I said not a bad thing, just a challenge to accomplish it all in one day as deep as I would have liked. Thanks so much! Great bible study! This study reminded me what I already knew but often need to hear again. Children need a good example to follow. And if I am requiring something out of my children I must require it of me and dad first. It also was a great way to slow down again and think about parenting – one of the most important things! Life goes so fast and we move from one stage to the next in parenting so quickly that it is important to slow down and reflect often! I really enjoyed the layout of the study! The only things I would change are: maybe not offer it during summer. We are so busy on vacations and travels during summer an in depth study can be hard to manage. Especially when I don’t always have internet. The only other thing to change that can easily be adapted in our individual ways is not offering a study on Sundays. But I am able to do that on my own so not really a needed change. The Lord always teaches me so much through your studies. One thing that is really sticking with me throughout this one is the importance of thankfulness. When I’m tempted to complain I need the Lord’s help to use my tongue to praise Him instead , for He pours His benefits on my life. I don’t have a suggestion for improving the study but I just want to tell you that I love how the studies include the children. This Bible study has served as a good reminder that I need to make sure I am modeling the behavior I expect from my children. If I’m not being patient with them, how can I expect them to be patient with each other? It’s always good to be reminded to evaluate my own actions! This is the second “30 days” study I have done and I honestly can’t think of any way to improve them. I think it’s great just how it is! One thing I’ve learned this time, as I go through this Bible study, is how important it is to be in God’s word everyday. I’ve been struggling with a health problem that has often left me exhausted, and as a mom and wife you’re always busy! I’ve learned daily study is just vital, and there is absolutely no excuse to not do something (we have Bibles on our phones that will read to us!). Praise be to God for helping me to finally see this, I CAN study.. even if I am exhausted!! Thank you for making this study available. It was very eye-opening and challenging. The biggest problem I had was figuring out how to use the Blue Letter Bible while reading the post. I was using my I-pad, so I ended up having to use two devices so that i didn’t constantly have to flip back and forth between the e-mail (telling me how to use BLB), and the BLB itself. I suppose that isn’t really an issue you could fix, as it is a matter of learning the app for myself. But, in the beginning it was very discouraging and time-consuming. What I learned in this study that most impacted me was the word “obey” The same word that requires obedience from our children is the same word that requires me to submit to my husband. Ouch! That was very challenging for me. God has really been teaching me the importance of prayer. I really appreciate the time and effort that goes into these studies. They are truly a gift. The only difficulty I personally have with them is that I have made a commitment not to be on any electronic device after 6 pm or before 8 am. And of course, it is during these times that I usually read and study my Bible. So I have had to try to figure out a way to find time to do the study during the daytime…which has proven challenging! Question 1–I was reminded about the absolute importance of the Word abiding and dwelling in me. If it doesn’t, how can I possibly be a good example or provide instruction for my children? A good challenge and reminder to keep first things first in parenting. Question 2–I absolutely love these studies. They are so practical and doable for busy mamas. The only thing that might be helpful is more guidance on how to complete the study if you don’t have constant access to a computer or device. Sometimes my husband is using our one computer almost constantly, and being able to use print resources would be helpful. That being said, I have appreciated learning how to utilize on-line study resources. One of the big things that has been hammered home lately is that in order to teach my child to be obedient, that I need to be obedient. How can I expect my daughter to learn if I am not a good role model. My idea for improvement would be to make a printer friendly version of the study. Sometime I like to go places where there isn’t wifi to work on these things. (I get easily distracted by Facebook). I was most impacted by the reminder that it all starts with my behavior first. That my sin is displeasing to the Lord and that my behavior needs a lot of work since I started having children. I need to be gentle in my approach. I realized that I often need reminders on how to act so I should not be frustrated that my children do as well. I thought the study was very well done. I loved learning how to use the Blue Letter Bible. The only issue I had is that it started right near a holiday- 4th of July. We actually had great weather here (which has been rare this summer) so we had a great stay-at-home vacation. So, I got behind right away and that was frustrating. But, it was only my fault really! One lesson I learned is that I often ask too much of my children and not enough from myself. I need to be just as disciplined as them so I can set the example. I thought the BLB was confusing. I did not use it. I prefer to use my own Bible app. I would suggest not using BLB in future studies. I learned how to use the BLB, which I love, it was so simple to follow. I felt like I have a better grasp on how to study the Bible. I’m excited to continue using it in the future for personal study. Another thing I learned was on the day we studied about Christ’s obedience. I had never connected the dots between His suffering and His obedience. It was a beautiful reminder of what we are called to, as well. I’m not sure that I have an improvement to add. I would love to know how your brain works though, to put this all together. The hardest thing I found was that some days material took a long time and others were quicker. It made it a little difficult to plan for sometimes, but overall it was great! God has taught me several things already..1) just how important words are in our children’s lives and to be sure that I am choosing the right words to say to my little ones. 2) Parenting is not a drive-thru. It doesn’t happen over night. It is more like a slow cooker or a wood burning stove. It takes TIME, energy, love, patience, kindness, and a LOT of help from the Lord to help these littles grow up in Him. I have no suggestions – only to please keep doing them! They have radically changed my life as a mother! THank you! In my study I read through Mt 5:22 – … anyone who is angry with his brother will be subject to judgment. It really convicted me about my anger to my children I have at times. I really love your study and the way you lead us into deeper thoughts. Thank you so much for your amazing example for me as a younger woman. I just wish that the Blueletter Bible would not be on the computer, I find it hard to do the study, if I always have to stay at the computer as I have no ipad or the like. Christian since I was seven years old, and I am just now learning how to worship Him. He inhabits our praises!!! Bible study wisdom and taking the time to teach us how to study on our own. I have no complaints about these Bible studies. One of my favorite parts is the lesson portion for our children. My children especially enjoy when I do the Busy Mamas studies because they know they will get to have some really cool lessons, too. The suggestions are great… not only spiritual and Bible based, but fun! But, sometimes I feel like my 14 year old son is too old for some of the suggestions. So, some ideas for older children would be great, too. I believe the most important and exciting piece for me, has been learning to really live out my faith! to walk in it all day every day. To do the word not just to read it and to be the church not just attend it. So much more is caught than taught. So blessed by this study! If I could suggest anything…I would agree with a lovely comment from of above. I am blessed to have an involved husband. We felt like it could iclude suggestions for other family members. I am really enjoying doing this study, I’m not long into it after only finding it a week or so ago. It has come at a perfect time 🙂 So far, the most important thing that I feel God has shown me, is about my own obedience. I need to be obedient to God, by having a mind like Jesus and following His perfect example of obedience, before I can begin to teach this to our children. My only idea for improvements to the study would be, is it possible to include some sort of printables with the basic points, little pictures, key bible verses etc. I would love to be able to print things off to pop them around the house to remind me of key things I’ve learnt. I was struck most, at least so far, by the insights on obedience/disobedience. God doesn’t count, yell threaten. You obey or you don’t, which means you either have a consequence or you don’t. I was challenged to find the root of strife in my children. It has helped me to deal with the real issues, not just the behavior. I loved the study and did not find anything that I would change. I really liked using the different features of Blue Letter Bible this time (the Study tools). God has really been working on my heart to practice grace in my parenting — to parent my children according to the way He parents me. Thank you so much for sharing these studies! They are my favorite Bible studies and I always learn and grow so much! My suggestion would be to not include Saturday and Sunday in the study. This would allow 2 days to catch up each week. Hi! I just found your Facebook group and blog today thanks to a Facebook ad while scrolling through so I haven’t done one of your studies yet but I am working on a study about getting back to the roots of Christianity and it’s so good to have a refresher course. So often as “seasoned christians” we get of the mindset that we know this or know that or that we don’t need to read that again, etc. and it’s not true. That’s a sign that I’m letting pride take root again and need to remember that we all need these basic truths to stand strong. Hi. I will not change anything of the study. It is great. Like I said above, I am new here so haven’t had a chance to really look over things, I am looking forward to trying it though. Things I like in some of the bible studies I have done are short daily things, just a few questions to think about through the day not something long and mind boggling. Also only 3-5 days a week of work, Sundays are so busy already as a pastors wife and mom of 5 that I can’t fit extra things into the day and sometimes other days just don’t go as planned from before the alarm goes off so having some grace in there that if I don’t get to a study that day that it’s not going to set me back to where I’ll never get caught up. That is just frustrating and then I feel like “why bother” and give up. Also, I like things that help me see what we are studying more in depth, theology for dummies of sorts 😉 Help me to get my mind in the mindset of context, history, what they may have been doing, daily life, and more… make the scripture come alive. Like I said I have no idea if you already do these things, just some things I’ve found I like along the way 🙂 And I really like these teaching tools! I’m going to talk to my husband about them if I don’t win and maybe add them to our homeschool this year. I knew theoretically this already, but I have learnt practically that the Word of God is sufficient for all issues of life. His Word is truth and it has everything that we need for our daily lives, spiritual lives, for church life, for adoration… we do not need to invent or introduce new gimmicks or human inventions. A big thing that God has taught me recently is that I need to have an intimate relationship with Him. Not just do a little Bible reading and pray every day, but to really know and trust Him as I do with my husband. So that means talking to Him a lot and really getting in the Word, meditating and “chewing” on it. I would not change anything with the study! I love your studies and learn so much! They are a blessing!! As I do this study, I am convicted of how often I disobey the Lord. I need to obey Him in order to train my children to obey. The change that I would make is not even have a post on the weekend to give people the opportunity to catch up. I know the weekend activities are “optional” but they are so good so I never want to skip it. 1.What is one important lesson God has taught you recently as you study the Bible? That most of the times I read “man” in my English New Testament, the underlying Greek is not exclusive of women. In fact, many times there is no word underlying the translation other than ‘some’ or ‘one.’ This means that when God gave ‘some’ to be apostles, pastors, teachers, evangelists, etc. it doesn’t exclude women. This was a revolutionary discovery. 2.What suggestions do you have for improving this study? What would make it more useful or easier to use? Take out the pictures. I cut and paste to a word processing program to study on my home computer, and they just clog it up. They don’t come through on my home computer, and often crash the program I save them in. Something I am learning is to slow down with my children and take the time to give them instruction and talk with them. I really appreciated considering my own obedience, as well as that of my children. I am still working on the bible study…very encouraging so far. Matthew 6:14-15 says “For if you forgive others for their transgressions, your heavenly Father will also forgive you. But if you do not forgive others, then your Father will not forgive your transgressions.” Forgiveness is absolutely essential to the Gospel and should be ever-present in our lives, most especially in our families on the frontlines of child training. I’m so thankful, Pam, that you dedicated several chapters specifically to forgiveness…in the day to day comings and goings it seems much easier and tempting to put down a disagreement between siblings or between myself and a child by just a few words like “Are you being kind?” or “Wouldn’t it be better to put your sister’s needs before your own?” instead of recognizing the many opportunities to point them to Christ, highlighting our utter depravity in sin, and teaching forgiveness. Joseph’s life is such an excellent example that you bring attention to in this study and it is simple enough for the littlest of children (like my own) to understand…of the many ways to share the Gospel with my children, the opportunities God gives me daily through the many little quarrels and arguments are exceptionally useful for teaching and instruction in the humble practice of forgiveness. Knowing also my many imperfections and sinful tendencies, I too have multiple chances throughout the day to model forgiveness for my children! May we always be quick to forgive and not harbor bitterness in our hearts against others that our Lord in heaven may also not remember our iniquities and be so inclined to forgive us! May we teach forgiveness to our children daily and impress the importance of it on their hearts so they will always carry with them the forgiveness of Christ to the glory of God! The great importance of forgiveness cannot by overstated, should not be overlooked, and never be outgrown. Thanks again for really focusing on this in your recent study as in order to point our children to Christ, they must first recognize their total depravity and need for forgiveness of their sins. 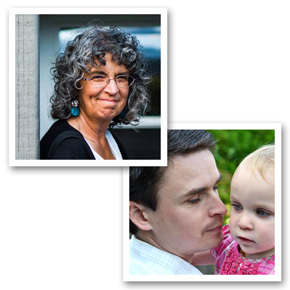 All of the Busy Mama studies are wonderful…truly!!!! I really had to take some time to think hard about this second question because they are all so excellently done. I would only have two suggestions to make…the first being…this study could be improved by publishing it into a book just like the previous ones…I have every one of the published Busy Mama books and they are exceedingly more accessible to me during a busy day chasing down toddlers climbing on things they shouldn’t be and more…I find myself rarely having the time to start up my computer and find what I’m looking for…it’s much easier to just have my books all laid out on the table ready for me to open up and dive in right away….so my hope would be that this study would also go on to be published like the others 🙂 Also, and this really might just overload the study as there is plenty of material for each day and trust me, I usually end up using every one of those catch up days, but I just love the study of hymns and sharing the rich history behind them…maybe under the title of “for additional consideration” or something similar, a reference to a hymn related to that day’s study may be useful/encouraging…maybe even not in every day, but maybe after every six or seven days add in a little hymn study. Just some thoughts, but really, if you kept them just as they are, I promise to still read them!! 😉 Thanks also for doing these giveaways from time to time…just love each and every resource you’ve developed! They have been a tremendous blessing for our family and especially for me, not having the Titus “older woman” in my life to teach me these things that are so essential for a life lived for Christ. Thank you so very much! My husband and I teach a parenting class and we have taught that “the rod AND reproof bring wisdom”, but teaching this last class it became more real to us and to the parents in the class. It was so encouraging to see the light come on in them as we taught this scripture. Young children need the rod to drive out the foolishness but they also need reproof learn to recognize their sin and be forgiven. Your Bible studies are great as well as your other blogs. I love your word studies. I refer parents to your website all the time. I have been learning that prayer that isn’t from the heart is not prayer at all. The Holy Spirit will not only give me the desire to pray, He will lay burdens on my heart in order to help me know what to pray about. I didn’t know about this study, but wish I had! I am really struggling with this at home with a 1,3, and 5 year old! God is showing me that it is all about HIM and He is working all things for my good. I need a parenting study, because I have always been struggling with my daughter and she is now 11. One important thing I have learnt recently is that all the Gospels, while from different perspectives, all point to who Jesus was as a person, and his nature/character. They (the Gospels) were all written by different men (eyewitnesses) in order to show a different aspect of Jesus’ character to those who needed to understand that particular aspect of Christ. Each Gospel was written by a different man to a different audience, for a different purpose, but they all point to the one person. For example: Matthew’s Gospel was written mainly for the Jews about a Jew to present Jesus as the King of the Jews. Mark’s Gospel was written mainly to the Romans to show the dual focus of Jesus’ life, which were service and sacrifice. Many people say that the Gospels contradict themselves, therefore the Bible can’t be true or accurate. This study I’ve recently done proves differently. The most important lesson I learned was that I cannot lead my children to Christ if I am not spending time in the Word on a daily basis. As for improvement, the only thing I would suggest is to have shorter daily studies. As a homeschool mom, and the mother of a special needs child, some of the lessons had to be divided over two or three days, and that put me behind other posters on your Face Book group. Because of that, I felt I was not able to share in what others were commenting on, and that I could not ask for help or insight because we were not on the same page.